Researchers at Harvard School of Public Health have released new resources for parents and teachers to help teach children about good nutrition, exercise and healthy life choices. Please see their websites http://eatwellandkeepmoving.org/Home/Parents and http://foodandfun.org/ for resources in English, Spanish and Chinese about sugars, fats, whole grains, exercise, hydration, screen time limits and other topics. There are surveys for self assessment as well as posters, recipe books and links to authoritative sites and resources. 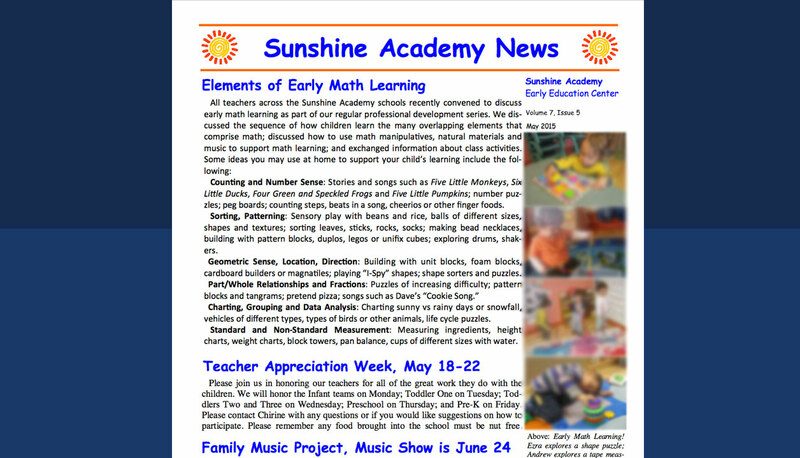 All Sunshine Academy teachers will work with the materials this year at one of our Professional Development Day workshops. Led by Sara Raposo, an affiliate of HSPH and a parent at our Washington Square school, as well as Brett Otis, a co-author of the Eat Well and Keep Moving textbook, the workshop will emphasize the research that supports their new guidelines as well as healthy food activities that can be done in the classroom. We look forward to learning more about the materials and implementing new healthy eating projects in the classroom.